On one of the many road trips my wife, Leslie, and I took before retirement, we stopped for lunch along the freeway in central Illinois at a place called Amish Buffet. It was amazing, and I wanted a little of everything. But the fried chicken was the best. It tasted like what my grandmother used to make. That’s how we feel now that we’ve moved to Ajijic, Mexico: We’ve found the best that the buffet has to offer. We’ve been vagabonds since October 2016, living in a variety of countries for six weeks to two months, looking for the best retirement spot. We’ve lived in France, Spain, Costa Rica, Malta, and several cities in Mexico. We had been reading International Living for several years and attended a 2016 event in New Orleans. So we embarked on the journey with lots of good advice and tips from those who had already sampled the world’s buffet. At first, we focused on Europe. But the more time we spent in Mexico, the more we liked it. 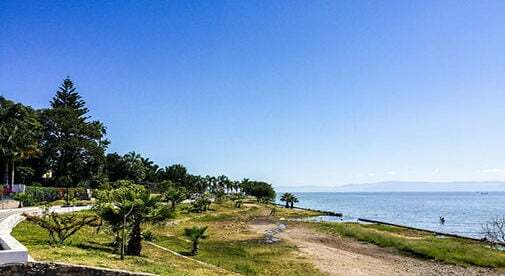 Mexico has everything we were looking for—great climate, friendly people, thriving expat community, lower costs than in the U.S., and proximity to family and friends in the U.S.
Now it feels like we’re finally home, in the Lake Chapala area south of Guadalajara. The climate is excellent. Even in December high temperatures are in the low 70s F, and it feels warmer in the sun. A sweater is all you need, and sometimes that’s too much. Overnight lows are in the low- to mid-50s F, so I toss on a sweatshirt for my daily sunrise jog along Ajijic’s malecon (boardwalk) with its amazing lake and mountain views. The locals are friendly and helpful. Many, especially those in the service industry, speak at least some English. Grocery and discount store employees often don’t speak English, but they usually understand a little of my basic Spanish, and they work hard to help me find what I need. There are thousands of mostly U.S. and Canadian expats here. We’ve already made many new friends and have become involved in a great English-speaking church that offers plenty of activities and does lots of community outreach. The Lake Chapala Society is also an outstanding resource. They have libraries for books and videos, and they offer classes that help expats adjust to living here. And then there’s the cost of living. Today my wife and I went to the weekly street market—the tianguis—and brought home two big shopping bags full of veggies for about $14. At my favorite tortilleria I get a stack of 20 to 25 of the best corn tortillas I’ve ever tasted (still warm) for about 35 cents. Prices are a little higher in grocery stores. We’re renting a new two-bedroom, two-bathroom townhome one block off the lake for $1,400 a month, and that includes a twice weekly housekeeping service, a gardener and most utilities. While you can spend more for luxury homes with stunning views, there are also smaller places that rent for less than $1,000 a month. We can walk to the main plaza and to some excellent restaurants, where we’ve paid a little over $10 on lunch for two and about $30 for dinner with wine. Finally, Mexico is close to the U.S. We can get back fairly quickly if we need to, and family and friends can come visit us without an expensive eight-hour plane ride. A few of our friends have already asked if our guest room is ready. Yes, it is! When we left the U.S., some people asked, “When are you coming back?” We expect to receive our Mexican permanent resident cards a few weeks from now, so the answer is, “We’re not!” We’ve found our new home, and we think it’s the best place on the buffet.